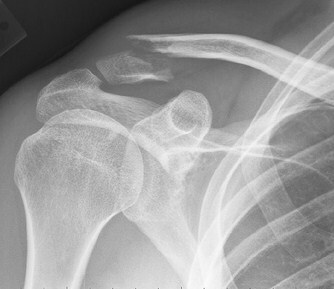 On Monday 4th of June I broke my collar bone. I was cycling to work in the morning as usual when I hit an obstacle and flew through the air over the handlebars. I landed on my left shoulder and rolled a little on the hard tarmac. In the heat of the moment I thought I'd come out of it pretty well, a few cuts and bruises but I didn't imagine I'd broken anything. But a check up at the hospital revealed that my left collar bone was in fact broken. The hospital sent me home with strapping around my shoulders and instructions not to do any sport or lift things. Four weeks of immobilisation lay before me. I could do almost nothing. I had to rely on my family to run the house and even to wash me and tie my shoe laces. I had a go at playing guitar but quickly discovered how important a well-anchored shoulder is to playing. I had to resign myself to give up on guitar too. It was a frustrating time, not playing guitar and not doing anything else all day was hard for me. But I found three musical activities that kept me working on my guitar skills and helped to sooth my frustrations. Right after my accident my right hand fingertips were pretty cut up and sore. But with my middle finger that had escaped without harm I could pick out little melodies on my son's piano. I'd recently watched a film about Woodstock because my daughter studied it for a school project. So I tried to pick out Hendrix's star spangled banner that I'd seen Hendrix play by ear. I don't think I actually got it right, but I had fun trying and I'm sure I learned in the process so I'll be a bit better next time I try to pick out a melody by ear. After a few days I thought to myself that I could work on my picking hand, I didn't need to move my left arm for that. So I propped my guitar on my lap and worked on some strumming and picking exercises with my right hand. I did all that with open or muted strings and left my left arm in peace. About 10 days after my accident I caught sight of a ukulele in one of our cupboards. I immediately thought that I might be able to play its very short neck without moving my left arm about. I was right, and I spent a happy hour strumming away songs on it. I repeated the experience regularly during the following weeks. A couple of days ago I had a check up and my collar bone is healing nicely. I still can't hold my guitar strap over my shoulder, but I can start to play the guitar a bit again. I'm thankful for that. But I'm also thankful that my experience taught me that no matter how improbable or difficult it seems, no matter what obstacles there are, I can always find a way to learn and develop my musical and guitar playing skills. If you enjoyed this post sign-up for more free guitar tips from Not Playing Guitar delivered to you by email. The UK magazine site Music Radar recently published its list of 50 tips to help make you a better guitar player. There are a lot of tips that will help you to make progress in this densely packed list, enough to keep you busy for a long time. In fact there are so many that if you try to put them all into practice at once I'm sure you'll be overwhelmed. I think it's a great list to bookmark so you can revisit it from time to time and pick a tip or two to work on for a while. Maybe you'll find my list of favourites a useful place to start. It's not that the other tips are not all valuable, they are, but there are just so many you can't work them all at once. These are just my personal favourites at the moment. If you're in a real hurry to get going, then here are the 3 tips I think are the most essential. First, realise that it's never too late. Then immediately book yourself a gig, even if it's only playing for your grandma at the end of the month. Finally, get off that forum (or web site) and get practicing. Do you have a favourite tip in the collection, or your own personal one that didn't appear in this list? Click the comments link below to share it with us.